COMP Cams Tight Lash Mechanical Flat Tappet Camshaft Small Block Chevy 262-400ci 1955-98 Lift: .550"/.560"
COMP Cams Drag Race Mechanical Flat Tappet Camshaft Small Block Chevy 262-400ci 1955-98 Lift: .540"/.534"
COMP Cams 12-611-5 - Drag Race Mechanical Flat Tappet Camshaft Small Block Chevy 262-400ci 1955-98 Lift: .540"/.534"
Good for 350-377 on 3/8-1/2 mile tracks with fast corners. Best with open rules. 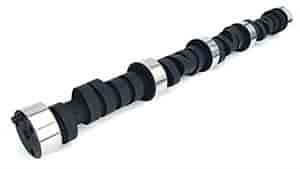 Comp Cams Tight Lash Camshafts are designed for Circle Track and drag racing applications where a tight lash is necessary. These cams produce good torque and power and can handle high, sustained RPM. COMP Cams 621-16 - Hardened Lash Cap Thickness .080"
COMP Cams 950-16 - Dual Valve Springs I.D. of Outer Dia. : 1.080"
COMP Cams 730-16 - 10° Titanium Retainers Valve Spring Diameter: 1.437"-1.500"